Alex Turnbull’s first company was Bantam Live where he was a co-founder and product manager before they were acquired by Constant Contact less than 2 years after launching. 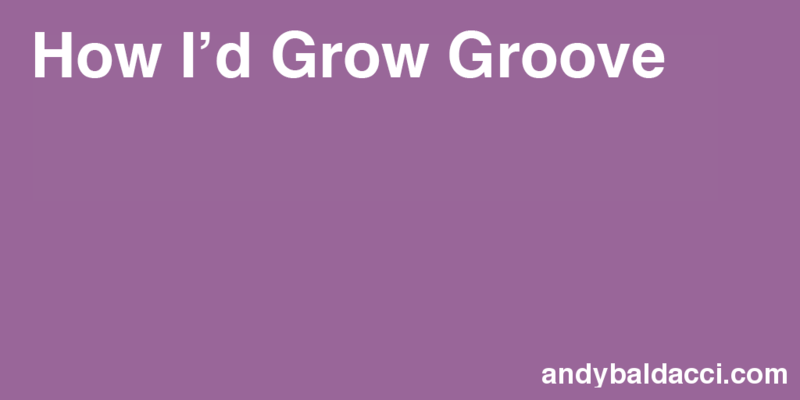 When he founded Groove, he wanted to try a different strategy. Instead of going for the quick exit, he decided early on that he would be in it for the long haul with Groove. 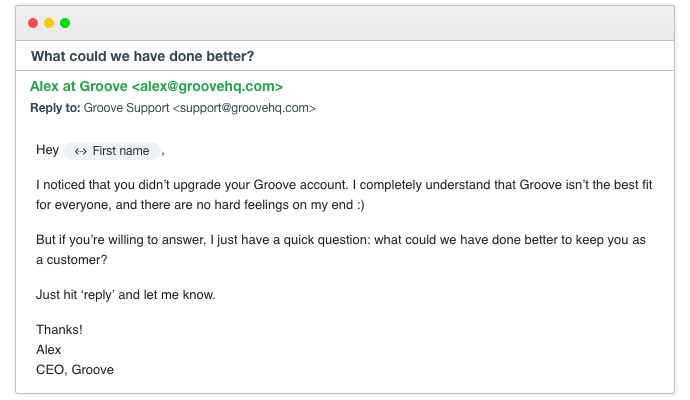 Early on, he waivered on that choice and spent (or “wasted,” in his words) 6 months entertaining acquisition offers to buy Groove while they were still in beta. After recognizing that for a distraction, he doubled down on his commitment to build something big and hasn’t looked back since. It wasn’t always easy, especially after being offered $12 million early on, as well as $5 million in VC funding, but Alex soldiered on and his gambles have paid off as they have grown to over $319k MRR and aren’t slowing down. 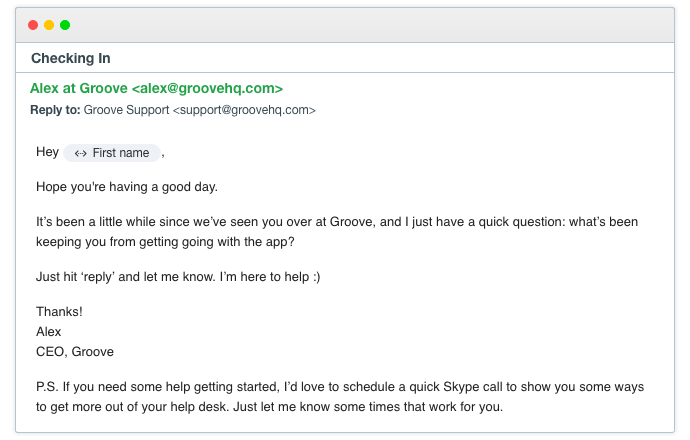 While Groove has experienced incredible growth, it didn’t happen overnight, nor did it happen accidentally. Content has been a huge driving force for Groove over the years, but one of the biggest sources of that content has been their serious efforts at optimizing their pricing and onboarding process. Early on, they tried just about everything with pricing from a pay-as-you-go model to a more complex, but highly customizable system. In the end, they realized that if they want to differentiate themselves by being the simplest and easiest app, their pricing needs to also be simple and easy. By having one single price with everything included and a 14-day trial, they increased trial signups by 358% and revenue increased 25%. The trial itself was another story, though. Early on their conversion rate was just over 8% and they knew they needed to improve. Alex and his team started from scratch with the goal of getting trial users real value so that becoming a paid customer after the trial was a no-brainer. They hit the nail on the head and their results proved it. If you’re reading this, know your trial is a bottleneck, and are wondering where to get started, then focus on those three areas (and check out my article on The 6 Growth Killing Mistakes You’re Making With Your Free Trial). 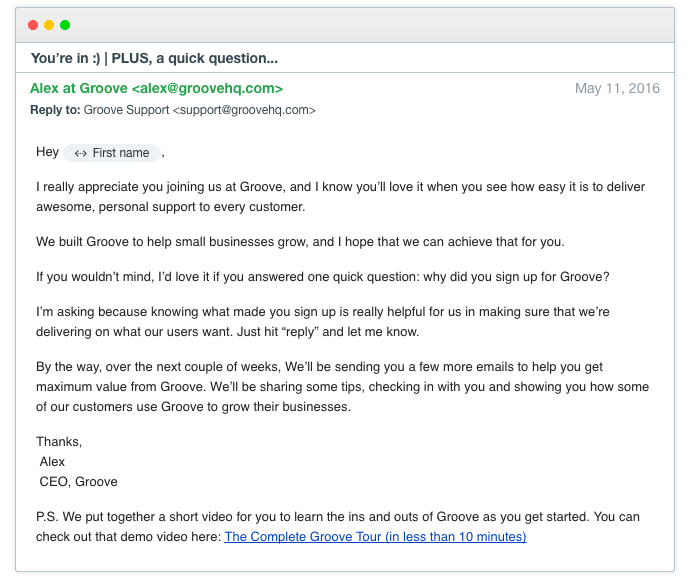 In most startups, the free trial sequence is the most neglected piece of their sales funnel, so nobody would have held it against the team at Groove if they never revisited those emails after their early wins. But that isn’t how Groove operates. While they’ve admittedly had other priorities, they treat their onboarding sequence as a continuous process of improvement and recently wrote a post breaking down where they are at now in that process. 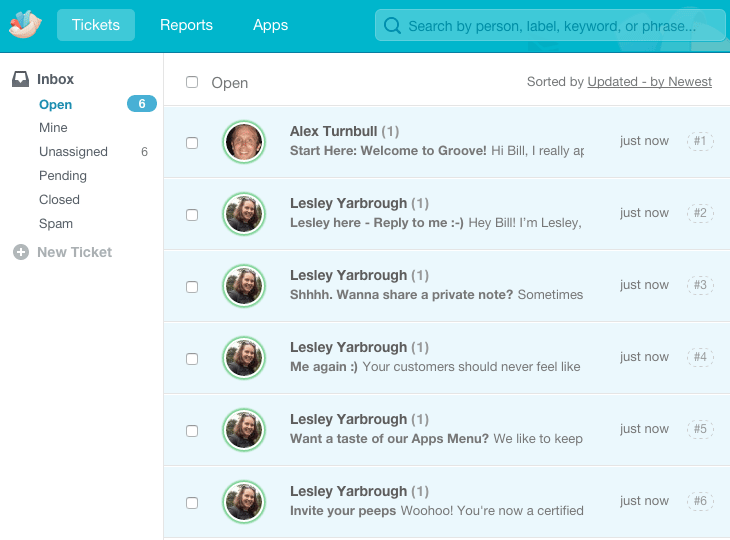 The goal of pre-populating every new Groove inbox with these messages is to help show the user how the app works and what they can do with it. This is a great idea and is much better than just welcoming them with an empty dashboard, but honestly, this it’s a bit overwhelming to me. As a customer I’m going to open the first message, skim it, and then delete the rest. The problem is that the messages are just trying to do too much, and most of what they are trying to do isn’t helping move them closer to their desired outcome. When somebody feels like they are being pulled in 1,000 different directions at once, most of the time they are just going to leave without taking any action. While the impact of this may be difficult to measure, I would test showing only the 2 or 3 of these that actively move the user one step closer to success, and incorporating some of the others with the onboarding emails. But most importantly, this email asks a critical question: why did you sign up? This email is really good (I mean, it gets a 41% response rate), and does what it is supposed to (get feedback so you can help customers solve their problems, and then build what you learn into the trial). They could try swapping out the “p.s.” for one reinforcing the main CTA of getting a reply, but again, I don’t think there is enough potential improvement to really spend much time on it. That being said, AB testing subject lines and CTAs doesn’t take much time. This email is good: short, to the point, one clear CTA. However, since they are sending the demo here, I would be much more likely to test removing the mention of it from the previous email so that you can focus that email just on getting a reply. I’d also try to use more benefit focused language than, “help you get the most out of the app” (Alex himself said, “they simply don’t care about ‘getting more out of their Groove account.’”). 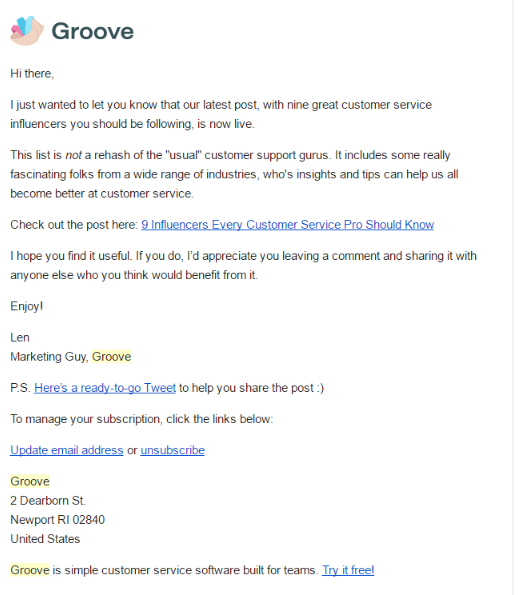 If these are so valuable, then I would strongly recommend that Groove finds a way to do this for their users. Maybe not in this first email, but send a follow up with an offer to do it for them using remote desktop software, walk them through it on skype, whatever. I would also be more benefit focused. You explain what custom info they will get, but don’t go the next step to explain why that really matters to them. This is where they start sending more personalized messages to users based on their actual behavior. Really good email. Once you have enough feedback and start to see patterns, you can preemptively overcome objectives with email or by improving your onboarding, but even still, having a higher touch way of getting customers unstuck will show a massive ROI. Need to know a bit more about when this email gets sent, but it’s the right idea: if you can identify signals that make it likely the user is getting value from your product and could get more value by upgrading, you need to give them the pitch. Also would need to know more about the conditions when this gets sent, doesn’t seem like the abandonment email. If I sign up for the trial and don’t upgrade, that doesn’t mean I canceled, does it? Couldn’t it just mean I’m staying on the “forever free” plan? In February I didn’t receive this email, but I did get the “upgrade” emails even though I didn’t really need to because I didn’t add anybody to the account. I would spend some time making sure the logic for when these emails are sent makes sense. These goals are exactly what they should be. You can't treat every trial user the same, so in any given trial you want to help the motivated users get to success ASAP, want to give steady (but not annoying) nudges to bring back those who have disappeared, and collect feedback wherever you can in order to improve the process. For those of you looking to overhaul your own free trial, start with these 3 goals and it is hard to go wrong. 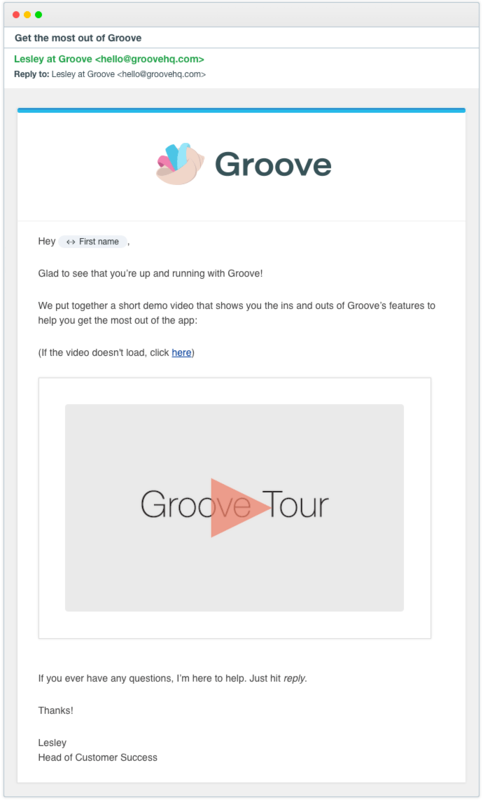 Groove “gets it.” The job of the free trial is to get the user to their desired outcome as quickly as possible and then make the pitch for why they should upgrade/buy. If they go off the rails and don’t seem likely to get to success, it’s your job to guide them back to where they need to be. Throughout this process you want to optimize for getting as much feedback as you can so that you can both improve the automatic process while also giving yourself a way to manually intervene and get the user to success. The emails they send all fit that role exactly, and while experimenting with different language, adding follow ups, maybe getting on the phone, etc. could give them some additional gains (and I know they are always experimenting), they are 80% of the way there. They should keep running tests, collecting feedback, and improving the onboarding sequence, but there are areas with significantly more potential for growth that should get the bulk of their efforts. They need a higher tier of pricing. I’ll be honest: I think this one may be a hard sell, but I don’t think there is anything else they can do that would have as big an impact on their bottom line as this, so I’m going to make the case anyways. 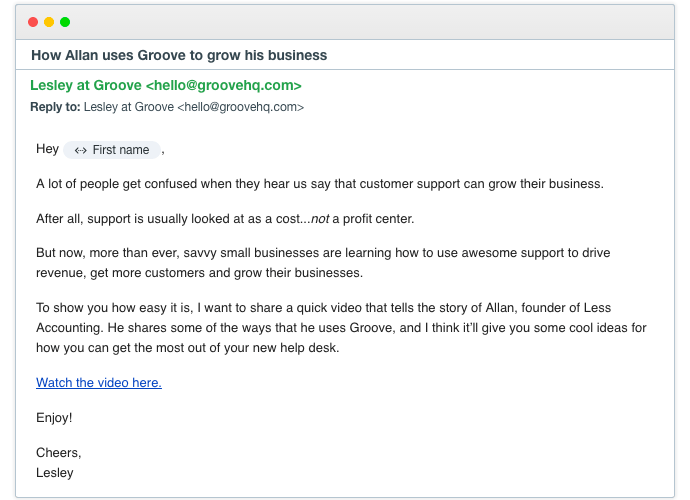 So it’s pretty clear that this concept of simplicity and laser focus on SMBs is part of the ethos at Groove, and I’m not trying to change that, but I think viewing it too narrowly is holding them back. Simply put, there is a significant portion of Groove’s current customers who are willing to spend more money to have their problems solved. There is also a significant portion of Groove’s current customers who are willing to spend more money just to have access to a higher level of support. There are people who are willing to give Groove significantly more money, and right now they don’t have an option to. 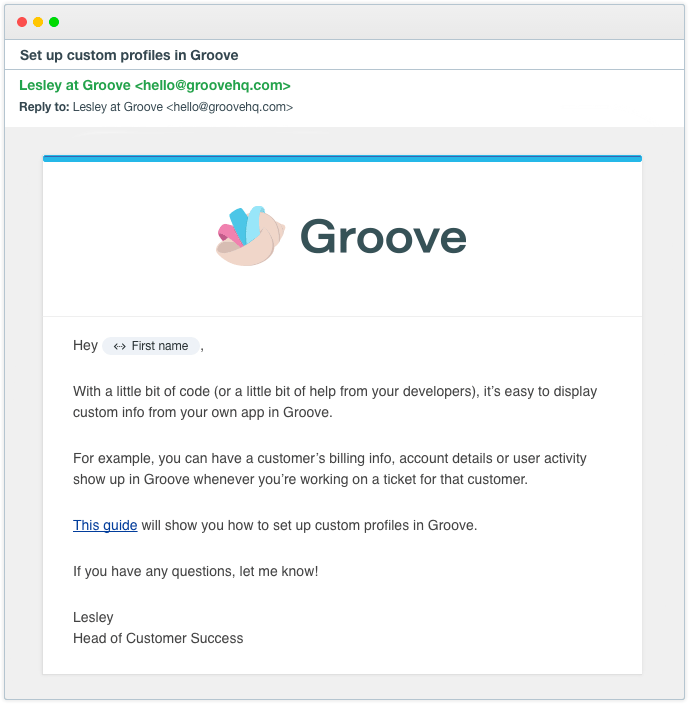 The Groove team makes communicating with their customers (and potential customers, too) one of their top priorities and are always looking to build out a more full-featured product. They could continue adding all of those features to the Team package, but as they continue to do that they are leaving huge amounts of money on the table. These “premium” features (please don’t call it a premium plan, though) could be things like an internal knowledge base, support for multiple languages, better reporting, etc. Or they could even be things that aren’t technical features like access to different support channels, different levels of response times, concierge onboarding, and SLAs. These may seem enterprise-y, but these features are valuable to many companies in the SMB market and right now they don’t even have the option to pay for them, even if they wanted to (and they do want to). Alex isn’t running Groove with the goal of sucking out every single cent from his customers, and I’m not suggesting that he needlessly jack up the prices or alienates his smaller customers. 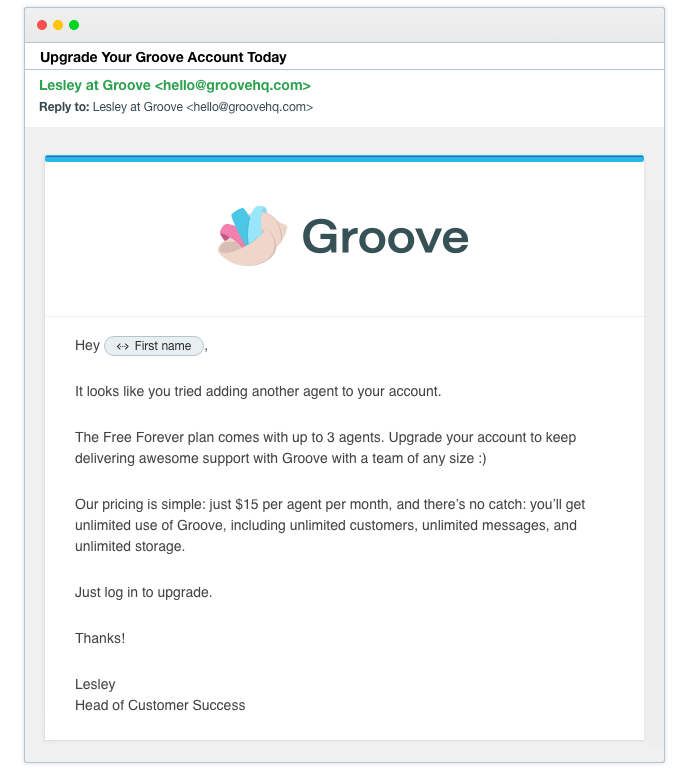 But by adding one additional pricing tier at a higher cost, Groove’s margins would improve, making it easier to expand the team and better serve all of his customers. When you increase the lifetime value of your customers, you increase your margins and you increase how much you are able to spend to acquire customers. I know Groove has experimented with paid acquisition with mixed results, and a higher LTV gives them more wiggle room to figure things out. It also gives you the option of potentially building a sales team for higher touch sales that wouldn’t be possible at lower tiers. If they do nothing else other than add an additional pricing tier (which is still a very simple and easy to understand model), their revenues will grow like never before. End of rant. Target people utilizing specific features of the free plan which show they are getting real value from the software (like integrations), or just the users with higher usage than average and try to get them on a 15 minute call to see “how they can get more from Groove.” I’m kidding. Uncover the benefits that other users who upgraded saw and offer to jump on a 15 minute call with these users to help them get those same benefits. I don’t want the brevity of this section to undersell it, because this could be the highest ROI tactic here because of how the relatively small time investment needed to get it set up. Every SaaS startup needs to have an automated series of messages that go out to the most engaged users at any tier to explain the value of upgrading to the next tier. Assuming your software provides real value to justify the price at each tier, then your customers will thank you for this, because you’re helping them unlock that value in their businesses. 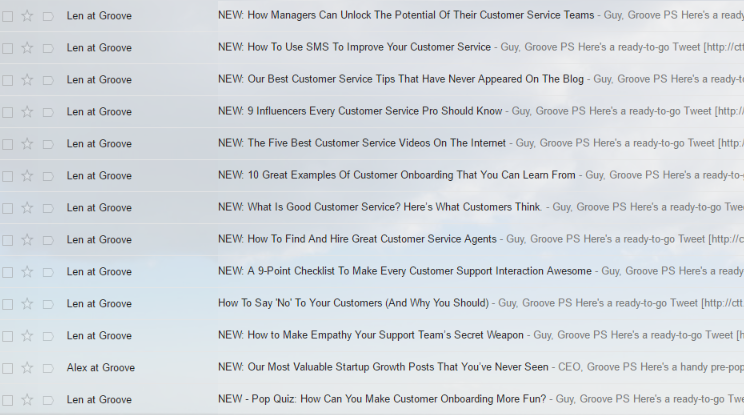 The blog email sequence has a reasonable pitch for trying Groove (this is something they should be testing a lot though, especially with their blog traffic), but then you get nothing, just blog updates that all follow the same template and don’t stand out. Now, I 100% get it. In a startup, there are always 1,000 fires that need to be put out at any given time, so if you find a template that is good enough, you’re going to stick to it until you can find the time to improve. The trouble is, there is almost never time to improve and templates stagnate. That being said, the templates aren’t the major concern here. Instead the focus should be on building a system to periodically get people to raise their hand and show they are interested in the software and then move them into a new pitch sequence. If they don’t buy, they go back to the nurturing sequence until the you repeat the process again. Something else they could try to deepen engagement with their list? 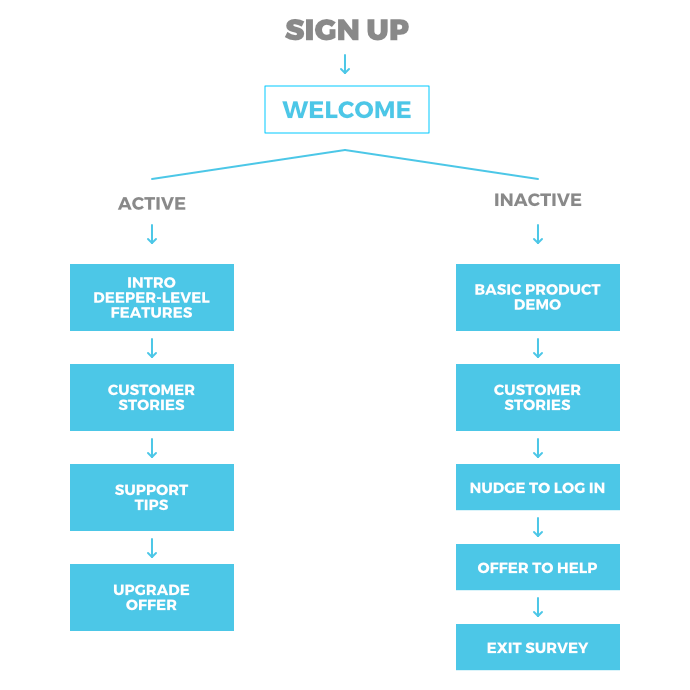 Bringing in people to host webinars, like KISSmetrics and Unbounce. This provides more value to your readers, and gives you an opportunity to demo your product in front of a captive audience. They co-hosted one webinar back in February StatusPage.io, but I haven’t seen any other experiments with it. By just staying in contact with their 50,000+ email list, they are going to get people to try out the software when they know they need help desk software. But how people people out there need help desk software and don’t know it? The email list should regularly give updates on your latest content, but it also should educate these users so that they realize what their own needs are. Groove’s Head of Marketing is Len Markidan who lead an early-stage SaaS company from 0 customers to a successful acquisition and has helped clients in dozens of industries unlock more than $400M in new revenue, funding, and acquisitions. Jordan Glasner is the Head of Product and Growth, and he has 10+ years of experience in SEM and SaaS marketing. Len and Jordan are the real deal and I won’t pretend that they haven’t thought of these areas for growth. Instead, like with any startup, it’s an issue of having limited resources. In startups, time is limited. If you try to do everything on your wishlist in that limited amount of time, nothing is going to be done well (if it gets done at all). Startup teams need to focus, and that’s tough when there are so many things to focus on, and I think if you look at Groove’s growth, it’s clear they have been focused on the right things. Right now groove is hiring a Senior Full Stack Developer and a Mobile Engineer. 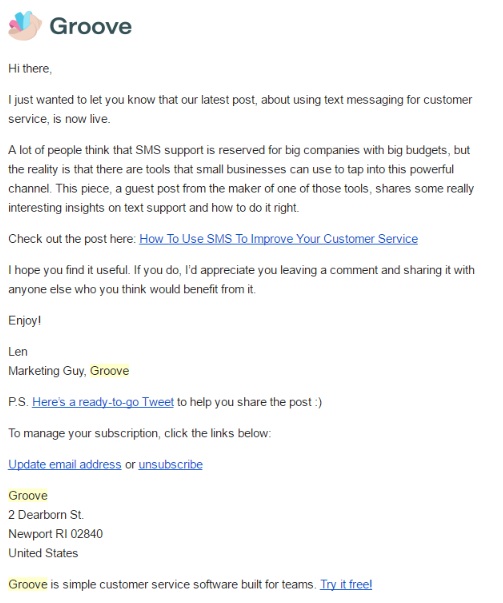 Tech startups need to always be recruiting great dev talent, and Groove is no different there. But to accelerate their already impressive growth, they need to start building a team to assist Len and Jordan so they can stop leaving money on the table. As a bootstrapped company, they can’t just go on hiring sprees like they just closed a $12 million dollar series A, so they need to be very deliberate with their hiring, even if that means slower growth. But how much faster could they hire more engineers or build out their support team if the LTV of their customers increased 50% because of a higher pricing tier? Or if they doubled the number of people on their email list that tried the product? Or doubled the rate of upgrades from the free tier to the paid tier? Bootstrapped startups need to carefully watch over every single dollar in their business, but they also need to take advantage of investments that produce an ROI. Making another marketing hire is an investment that will do just that. Could your startup use a plan like this? Startup founders are some of the busiest people I know, so while you may know that your free trial isn't getting the attention it deserves, there simply aren't enough hours in the day to change it. If you don’t have the time to dig into your ESP, review all the emails you’re sending, discover the optimal path for conversion, and plan out all the new emails and when they should be sent, then I have good news for you; I can help. My Trial Blueprint service does exactly that, saving you hours upon hours of time you don’t have by doing all that work and giving you a step-by-step plan you can hand to your team to execute, knowing the result will be a free trial experience that accelerates your growth. Not ready quite ready for that, but want to learn how to improve your free trial on your own? No problem! My essay, 6 Growth Killing Mistakes Your Making With Your Free Trial, will get you started on the right path.